Jonathan boy’s porridge on weekends has the most variety of ingredients as I have more time compare to working days where my time is limited. And since Jonathan can chew quite well now, I decided to cut the potato into tiny cubes rather than grated potato. To add some colour to the porridge, I put in a cut of salmon. 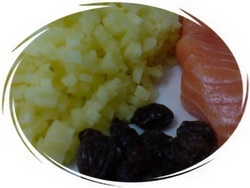 The porridge will turn out quite plain with just potato and salmon so I think some raisins will give a sweet-sour taste and additional colour to the porridge. It turn up pretty good. The taste blended well. To avoid Jonathan boy from swallowing the whole raisin without chewing, I don’t mix the raisin with porridge on his spoon. I fed him raisin only so that he will chew and be able to taste the raisin. Otherwise, I mash the raisin a little and mix with the porridge. You can substitute raisins with red dates or wolfberry. This entry was posted on Friday, September 26th, 2008 at 12:05 am and is filed under Family News, Jonathan's Meal. You can follow any responses to this entry through the RSS 2.0 feed. You can leave a response, or trackback from your own site. yummy, i love the healthy porridge! sometimes i cook more so i can eat the porridge as well…such a healthy porridge! oh, i never thot raisin can put in cooking porridge lei, with oat yes, but not porridge… hmmmm , Jeremy love raisin very much. Mayb i can try ur recipe , thanks for sharing. Wow… looks delicious! Will try this out one days. Good job Julie, you have make a nice and delicious porridge for Jonathan. So he can finish the whole pot of it? Its fun cooking for one little ones right…. how many teeth does Jonathan have now?? you’re quite a creative mommy! Anggie & Ryan’s mami – Happy trying. Joanne – Whatever you give him he will surely finishes all. Sometimes he ask for more. Littlelamb – Definitely fun. Full of experiment. Also, I can wait till he’s big enough to cook with me. Hui Sia – Total 8. Four each on upper and lower. this looks great! i must go and buy raisins for keira. have actually never let her try that before! Caroline, how does it taste like with the grapes? So good boy Jonathan. He can finished all the food that you prepared for him. Julie, you are so great, can cut the potatoes into that size. Salute. Me got to learn how to do it then! I plan to cook salmon, any other suggestion on the recipe? I never try raisin for Sethy, what a good idea you have here! what an awesome idea! 😉 its so nice to be living in malaysia where its easier to get the herbs like kee chi n all that. living here, we seem to want to follow ang moh style n i’m not into that. still giving arianna moi too but not as exciting as this la. i should be more adventurous. never thought of raisins! thanks for the idea. 😉 i normally use sweet potato for sweetness. Caroline – I’ve never tried grapes with porridge. Yeah, wonder how’s the taste. Joanne – Jonathan is not a fussy eater. That’s why I enjoyed feeding him. Yugene – I’ll share the salmon recipe if I have a special one. Mistymom – I bet you will load your luggage with chinese herbs each time you are leaving Malaysia. 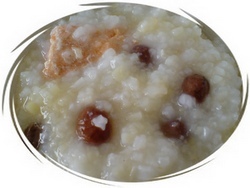 Nothing beats a good homecooked porridge made with loving thoughts. Never thought of raisins too….use dates and wolfberries too often already! wah… yummy! next time when i have to boil porridge for lyan fung, i’m gonna consult you first. hehehe!